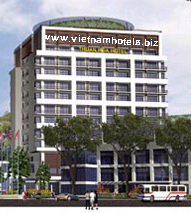 - Thuan Hoa hotel is located in the center of Hue City , near the bus station, central post office, the theatre and Dong Ba market. Only 10 minutes drive from the train station and 20 minutes from the airport. The hotel is in a garden setting and has a tranquil atmosphere . - 71 rooms. Suite, 1st class, standard. - Garden caf? shops, nightclub, gift shops, safe parking, sauna, massage, swimming pool and tennis court. - Conference hall 200 seats, meeting rooms 25 seats. - Organizing programs to visit Hue city - Lang Co beach - Bach Ma - Da Nang - Hoi An - My Son; Ho Chi Minh; Ha Noi and DMZ tour with A/C car and good guides. - Organizing Royal Party, folk song on Perfume River. - Car, boat, guides for rent. - Reservation hotel, train and airplane ticket. - Restaurant for 20-300 persons with European, Vietnamese food and Hue specialties. Royal Party, Royal Dancing, Hue traditional music.